We're now officially in Autumn. The equinox has been and gone and the nights are, as they say, "fairly drawing in". It's a time for comfort food and hunkering down with warm and tasty meals. It's also the key time for Scotch Lamb to be in season and at it's best. Whilst we tend to intrinsically associate lamb with Easter, historically lambs are bred in the spring rather than eaten then. As such a newly born spring lamb may look cute but it won't be ready to roast until the Autumn. Even then, there's far more to Scotch Lamb than just the Sunday roast. With a huge variety of fresh lamb cuts and products available it really comes into its own with regards to versatility, simplicity and speed of cooking. There's really no excuse for Scottish supermarkets and butchers not to be stocking Scotch Lamb at this time of year. 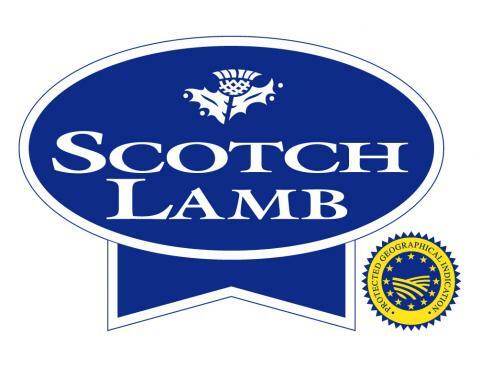 Keep an eye out for the Scotch Lamb PGI logo which is shorthand for wholesomeness, safety and taste. Only meat carrying this logo is guaranteed to come from animals born and reared on assured Scottish farms. You can be sure that whenever you buy Scotch Lamb PGI that it’s the genuine article. It has been quality assured for its whole life in Scotland; the farm and processor has been independently audited to make sure they meet stringent requirements regarding animal welfare and natural production methods. If you need further inspiration for simple and quick to cook delicious and nutritious mid-week family meals with Scotch Lamb checkout out www.whambamlamb.com for recipes and step by step videos. Whilst slow cooked and roasted Scotch Lamb is amazing, a huge variety of lamb dishes can be on the table in less than 30 minutes, perfect for midweek meals. As part of their annual “Wham Bam Lamb” campaign Quality Meat Scotland challenged me to make a quick and easy family meal using Scotch Lamb. 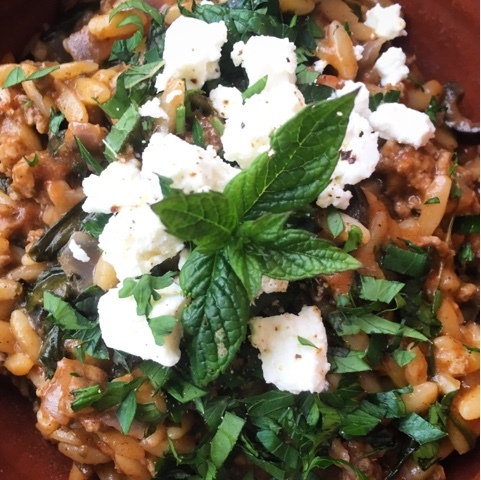 Initially I had Mediterranean Meatballs in mind but that will have to wait for another day as my sister mentioned a minced lamb dish that she'd enjoyed on holiday in Greece which featured Orzo pasta. A quick Google revealed that it was Yiouvetsi and it sounded right up my street. 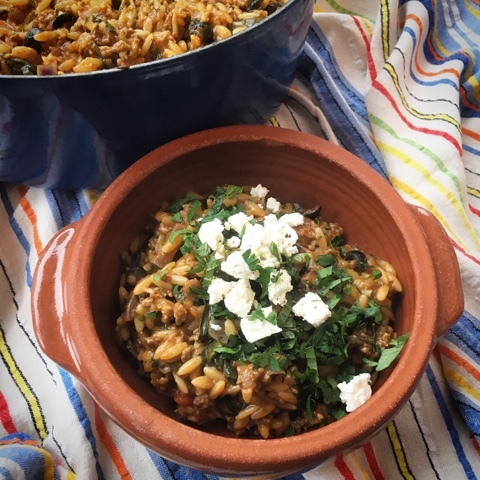 As a busy Mum with many roles to juggle, a one pot dish will always appeal. 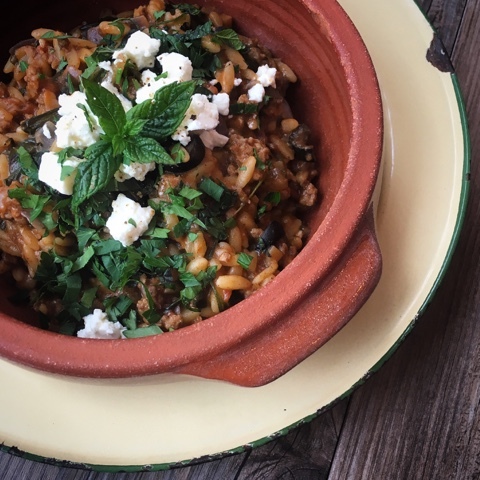 Yiovetsi traditionally combines minced lamb with tomato, oregano, cinnamon and orzo. I added a bag of spinach to boost the vegetable content and black olives as along with Feta they always scream Greece to me. Six of us enjoyed the dish accompanied by assorted flatbreads, pittas and dips however on its own it would make a substantial and delicious meal for four. I really hope you enjoy it as much as we did. Add the oregano, cinnamon and tinned tomatoes and mix well before adding the spinach. Allow it to wilt down then simmer the dish for 5 minutes. Finally stir through the black olives, taste and season well with freshly ground salt and pepper. 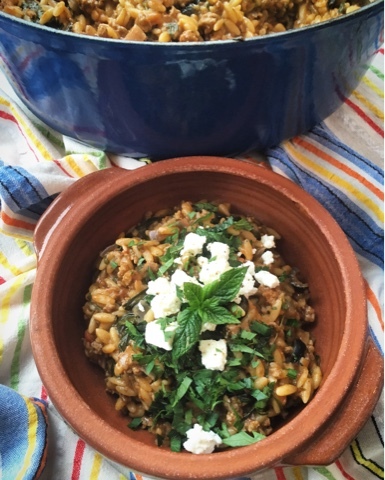 Serve topped with crumbled Feta Cheese and chopped fresh Mint and Parsley. Disclosure : This is a commissioned recipe for Quality Meat Scotland. As always, all views expressed are my own. There seems to be a week/day/month for everything these days. Some of which I can get behind more than others. 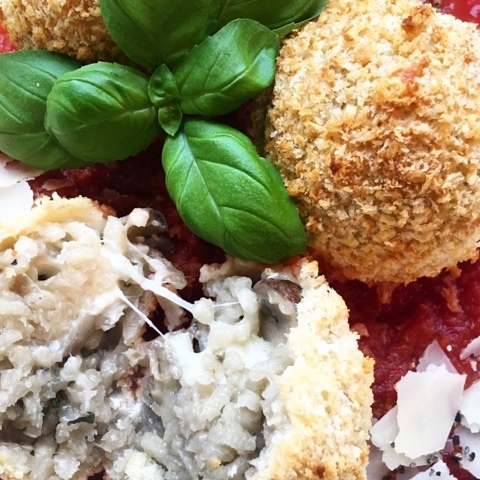 19-25th September 2016 marks the very first #NationalRiceWeek which I'm delighted to help celebrate with a recipe for Mozzarella Stuffed Mushroom Arancini. Rice is an absolute store cupboard staple of mine. Everything from brown rice, risotto, sushi, wild, pudding and basmati. 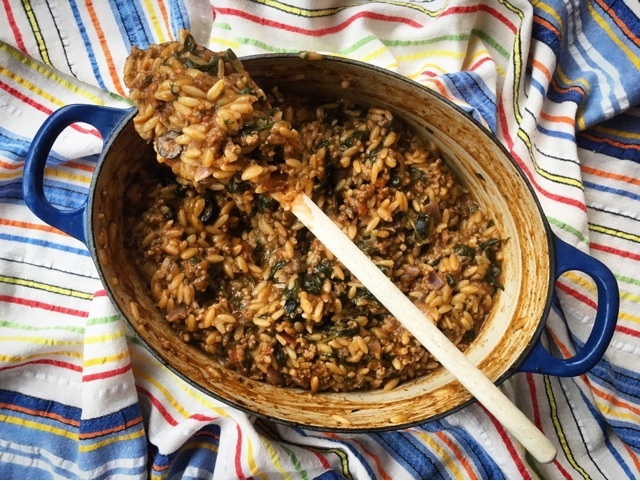 A quick look back at recipes I've created for the blog found a whole host that featured rice, here's some of my favourites. Love Rice have teamed up with the major rice brands, supermarkets and food magazines and throughout the week will be encouraging us all to to break free from our meal ruts with the help of rice. Keep a look out on social media for the #NationalRiceWeek hashtag where you'll find lots of inspiration. There's a different theme planned for each day of National Rice Week covering everything from leftover rice to packed lunches, Friday night Fakeaway's and bento. Love Rice want to inspire people to try new rice recipes, new rice varieties, dishes from a new cuisine, and to try different styles of rice. I'm a recent convert to both frozen rice and pre-cooked rice. I will put my hands up an admit that when I first spotted them in the shops I was a total food snob and thought they were something that I'd never use. How wrong was I?! I am a total convert to their convenience, flavours and versatility. Just another way to harness the delicious, aromatic, healthy and nutritious qualities of rice. 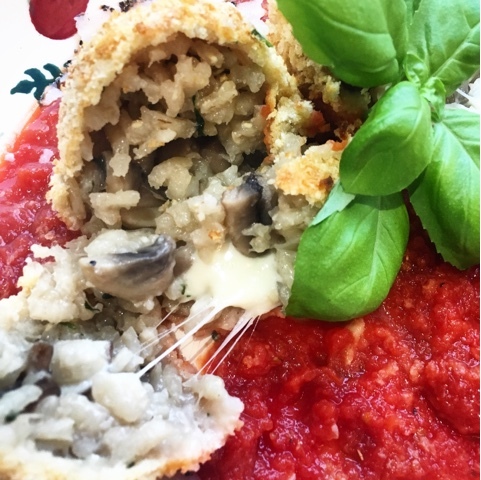 Moving on to the recipe I've created for Mozzarella Stuffed Mushroom Arancini. As always a recipe is only a starting point. 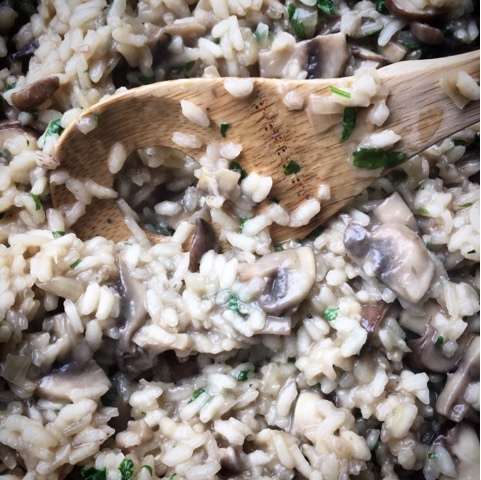 You could make these from any kind leftover risotto, you could even make your risotto from leftover rice, just add some cream to get the right consistency. Rather than deep or shallow fry my Arancini I've sprayed them with oil and then oven baked them. This works really well and the double coating of Panko goes nice and crispy. The hidden surprise of a gooey piece of Mozzarella in the middle is my favourite part of the dish. I'm somewhat of a fan of kitchen gadgets and gizmos and the wooden spoon you see in the photo below is in fact a risotto spoon. I'm not entirely sure if it makes a difference but the idea is that the large hole in the middle means that you can stir the rice constantly without breaking as many grains as you might with a solid spoon thus the rice isn't ground into mush. However a quick Google revealed another potential reason for the hole in that its there so some of the rice can pass through for a smoother and more flowing stirring action. Either way I suspect that the concept of my spoon may have come from a marketing department rather than Italy! 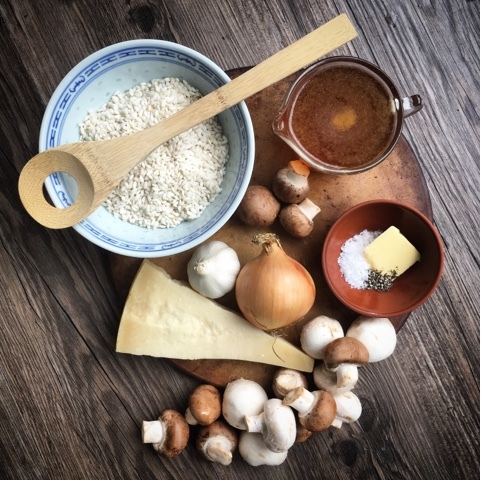 I'm sure you'll manage risotto making just fine with a regular wooden spoon! Heat the oil in a large, heavy based pan and add the chopped onion and crushed garlic. Fry over a gentle heat for 2-3 minutes, until softened. Add the sliced mushrooms and fry for a further 2-3 minutes. Stir in the rice and coat it in the oil, mushroom and onion mixture. Pour in a couple of hundred ml of the stock and simmer, stirring regularly, until the liquid has been absorbed. Take the risotto off the heat and add the butter, Parmesan and chopped Parsley. Taste and season with salt and pepper. You want it to be creamy and oozy in texture so add a wee bit more stock/water if you think it needs it. Divide the risotto mixture into 8 equal portions. 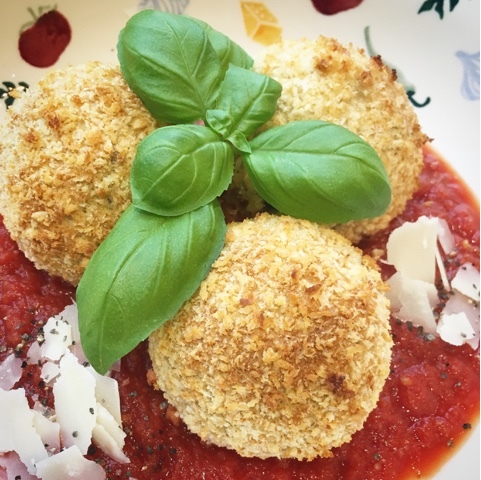 To form the arancini, scoop a portion of the cooled risotto into your hand and in the middle place a piece of mozzarella. Wrap the risotto around it to seal completely and form into a ball. Repeat with the remaining risotto and Mozzarella. 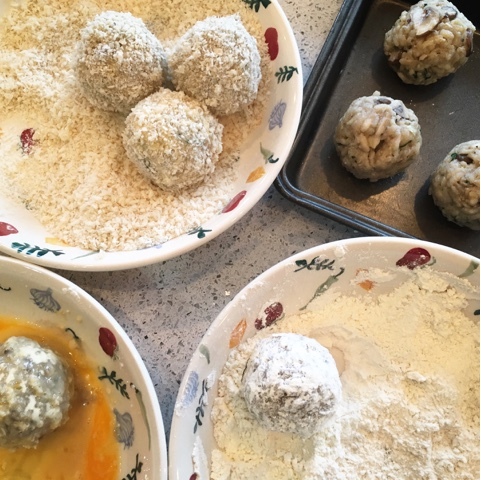 Place the flour, egg and Panko in separate shallow bowls. 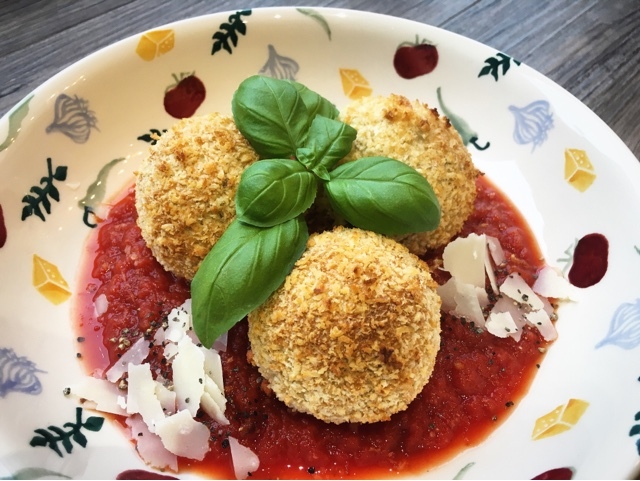 Carefully dip each arancini ball in the flour, shaking off any excess, then the egg, and finally the Panko, ensuring the rice is completely coated. Repeat again with the egg and the Panko so each ball has a double coating of breadcrumbs. Place the Aranchini on a baking sheet and spritz them with Spray Oil. Bake for 15 minutes before turning and spritzing again. Return to the oven for a further 10-15 minutes or until the breadcrumbs are just starting to brown. Heat through the Passata in a saucepan. Divide it between bowls and serve the Aranchini on top garnished with fresh Basil, shaved Parmesan and black pepper. Disclosure : This is a commissioned recipe for Love Rice. As always, all views expressed are my own. There's nothing like fresh fish. Healthy, nutritious and delicious. But how fresh actually is your fish? You might be surprised to know that recent research had shown that Iceland's freshly frozen fish fillets are actually fresher than those found on the fish counter of a leading supermarket. When you start to think about it, the reasons for frozen being fresher than fresh are obvious. If a fish is caught and frozen immediately (which often occurs at sea in factory boats) you literally stop the clock. The freshness is frozen in and nutritionally nothing is lost. However fresh fish on a supermarket fish counter could have been caught days if not weeks ago. There's something fishy going on there! As well as being fresher, frozen fish can often be better value and less wasteful. It's recommended that we eat 2 portions of fish a week with one of those being an oily fish. 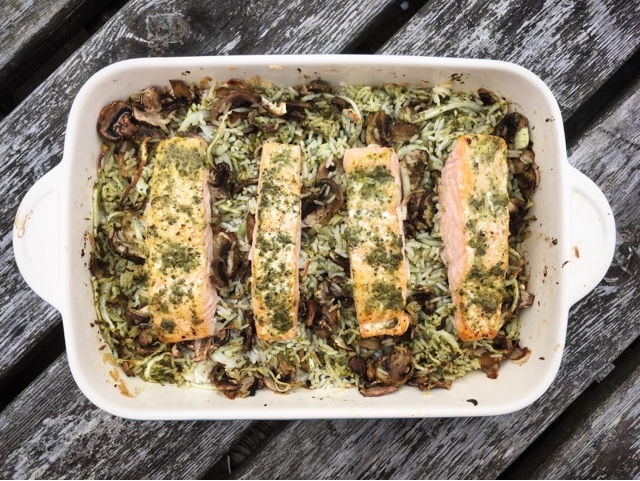 Even as a real fish and seafood lover I don't always manage this however by keeping a stash of Iceland's award winning fish products which include salmon, seabass, red snapper and scallops in your freezer you'll be well prepared for conjuring up fishy feasts in a flash! For something a touch more exotic be sure to check out their new Seafood Dishes Range. Frutti Di Mare, Sugo Alle Vongole, Guazzetto Di Mare and Zuppa Di Pesce. They've all been created to traditional Italian recipes and can be cooked from frozen in 9 minutes. Combine with pasta for a quick and easy meal just like an Italian Mamma would make. 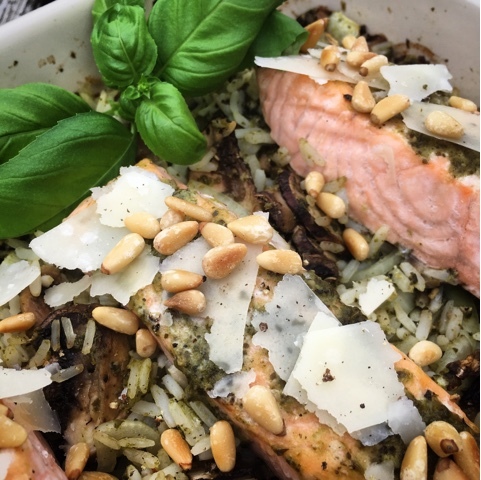 Time to unleash my inner Elsa and unlock the Power of Frozen with my recipe for Salmon and Pesto Rice Bake. 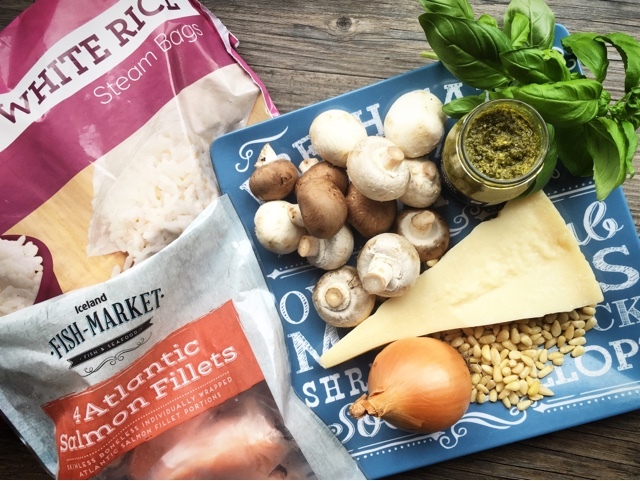 I've used a pack of Fish Market 4 Atlantic Salmon Fillets which retails at £6. These are skinless and boneless and come individually wrapped and cook from frozen in the microwave in only 3 minutes (30 mins in an oven). They've been approved by Good Housekeeping and are a staple in my freezer. I've combined them with a couple of pouches of frozen ready cooked white rice. This one pot dish takes very little time to throw together and makes a perfect family midweek meal. You can substitute the frozen rice with any type of precooked rice if that works better for you. Or you can use uncooked rice and increase the quantity of water to 600ml. 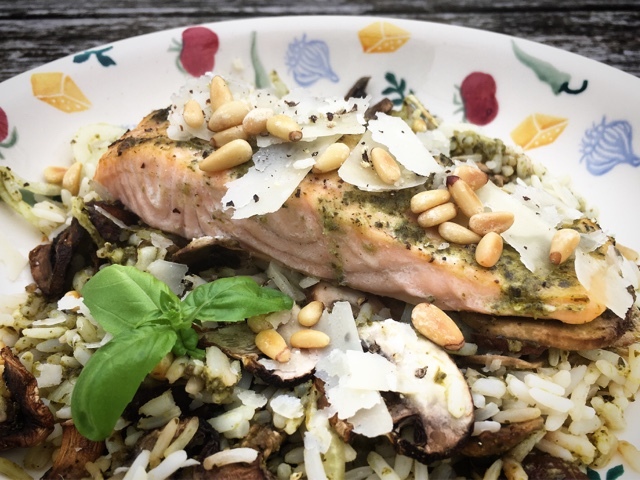 Cook the rice/pesto/vegetable mix for 30 minutes before adding the salmon in this case. That's your one portion of oily fish sorted for this week! Into a large ovenproof dish place the sliced mushrooms, onions and rice and mix well. 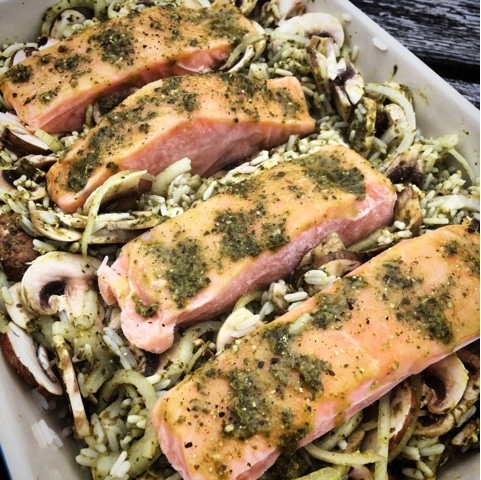 Brush the top of the salmon fillets with some of the pesto. Combine the remaining pesto with 100ml of water, pour over the rice mixture, season well with salt and pepper and stir through until combined. 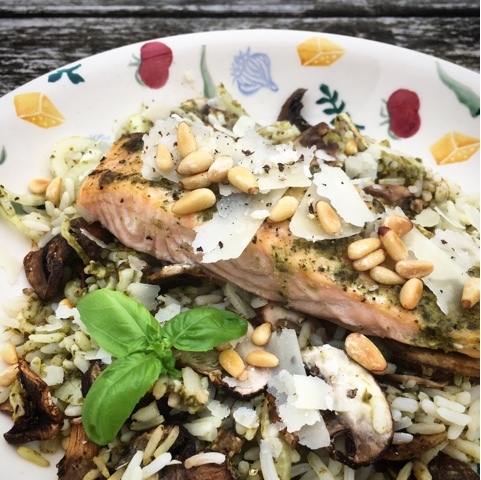 Nestle the pesto coated salmon fillets on the top of the rice. Serve topped with toasted pine nuts, shaved Parmesan and fresh basil. Disclosure : This is a commissioned recipe for Iceland Foods. As always, all views expressed are my own. Have you been bitten by the Bake Off bug? Along with most of the rest of the country, I most certainly have. I watched a wee bit of Series 1 and 2 but it was Series 3 that really caught my attention. That was the one with Brendan Lynch, James Morton and John Whaite in the final three. Being a Scot I had a real soft spot for James (and his Fair Isle jumpers) and was delighted to meet him in when I hosted a Bread demo and Q&A session as part of Aberdeen University May Festival. For the last couple of series, and the celebrity specials, a group of Aberdeen based fans of the show started meeting up on a weekly basis at each others houses to watch the programme and indulge in a cuppa, a bit of baking chat and lots of cake. It's been great fun watching with like minded individuals and having a valid excuse to get together on a Wednesday night for much sniggering at the innuendo, squealing at the disasters and celebrating of the successes. The theme for Week 4 this year is batter and from the looks of the trailer the bakes would appear to be Yorkshire Puddings, Pancakes and Churros. 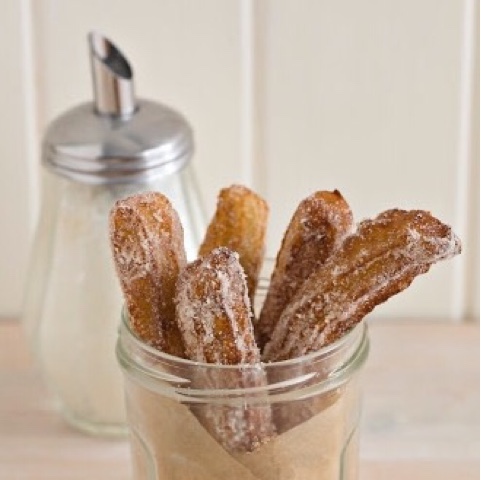 Rachel’s Organic who make those amazingly good creamy yoghurts, have compiled their best batter recipes and I'm sharing the Churros one below so you can try your very own batter challenge at home. All this batter talk has reminded me of a tongue twister of a batter nursery rhyme from my childhood Mother Goose book. “But,” she said, “this butter’s bitter! Hopefully no bitter batters on this week's episode although I am feeling rather bitter to learn that this will be the last series of Bake Off on the BBC. You can also find fab batter recipes for pancakes and waffles on the recipe section of the Rachel's website and learn more about the local farmers that produce the 100% Organic Milk that goes into all of their produce. I promise not to judge you if you also include some chocolate as a dip alongside the Rachel’s low fat vanilla yogurt. On your marks, get set, Bake! Disclosure : This is a commissioned post for Rachel's. As always, all views expressed are my own. 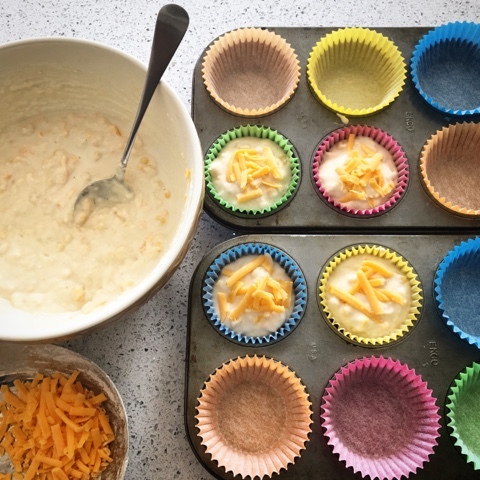 Recipe and images courtesy of Rachel's. 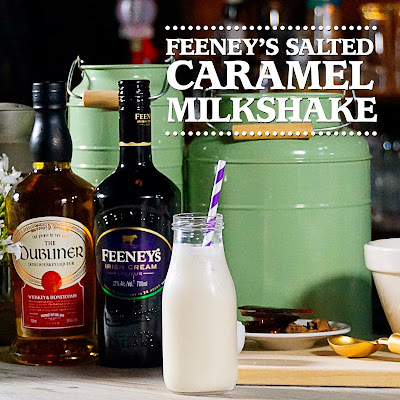 Is there anything better than a salted caramel milkshake? I thought not until I discovered one with a kick! 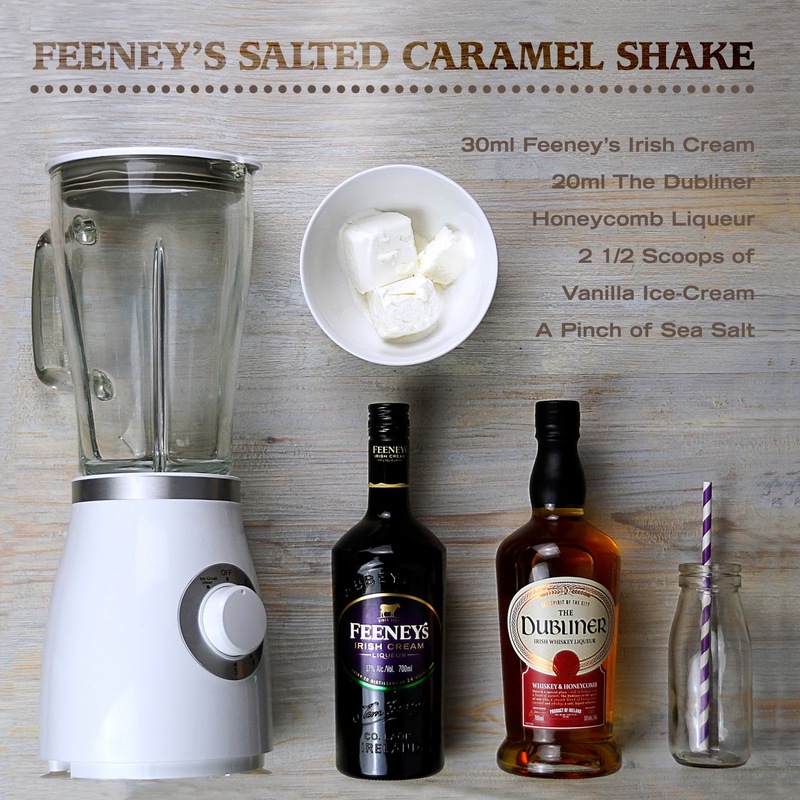 Feeney's Salted Caramel Milkshake. OMG this milkshake will totally bring all the boys to the yard. Available in both 1 litre & 70cl bottles, 17% ABV. RRP £12.50 for 70cl. How would you like to win a hamper containing everything you need to make your own Feeney's Irish Cream Salted Caramel Milkshake? Yup I thought you would! The hamper includes a bottle of Feeney's Irish Cream, a bottle of Dubliner Liquor, a milk bottle glass and straws with an RRP of £50. Disclosure : This is a commissioned post for Quintessential Brands Group. As always, all views expressed are my own. Keema is pretty much the Indian version of Bolognaise. Instead of using beef mince in a tomato sauce it uses lamb mince and peas in a fragrant curry. Like bolognaise it is fantastically versatile and once you master it you have the base for a huge variety of dishes. One thing to keep an eye out for when choosing your meat – whether its beef or lamb – is a quality mark like the Red Tractor logo. It means the meat is farm assured and is of top quality. Producers can only display this badge when they meet strict food safety and animal welfare standards so you can buy with confidence and a clear conscience. 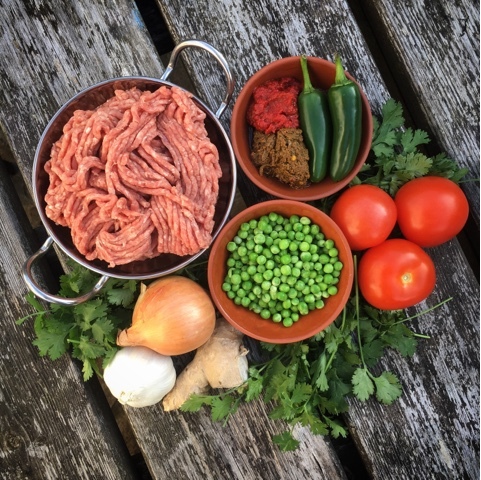 Simply Beef & Lamb have recently launched a rather tongue in cheek 'Keema Sutra' campaign which highlights how Lamb Keema can spice up family mealtimes and banish boring midweek meals. 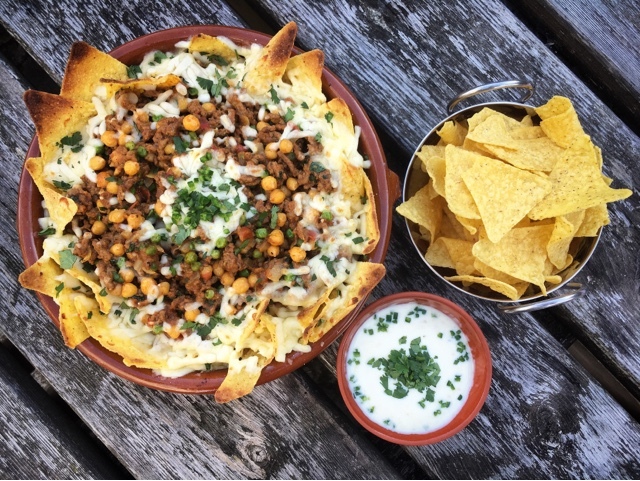 I tried out their recipe for Lamb Keema Nachos which both looked and tasted absolutely amazing. 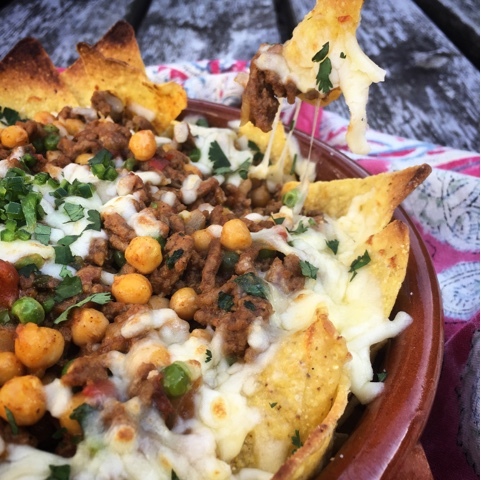 Give me stringy melted pizza cheese, curried lamb and tortilla chips and I'm in heaven! It was a seriously good dish. The Keema Sutra campaign is fronted by two 'Keema Nans' Mamta Gupta (my food blogging friend Kavey’s mother) and Pervin Todiwala. These Spice Girls are sharing their many years of Indian cooking knowledge and experience along with hints and tips to help you create the perfect keema curry at home. It really is super easy to cook. A one pot dish that can be on the table in less than 40 minutes is always going to be a winner in my book. By using a ready made curry paste you cut out the need for any complex spice combinations and can vary the heat according to you and your family's personal preference. Lamb mince really is a great way to switch up boring meals and feed the whole family affordably. 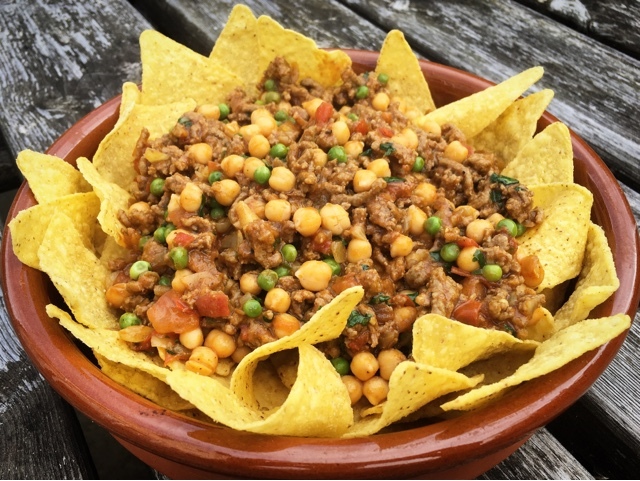 The lamb keema base recipe can be used in so many ways. I'm wishing now that I'd made a double quantity to freeze some for another day. 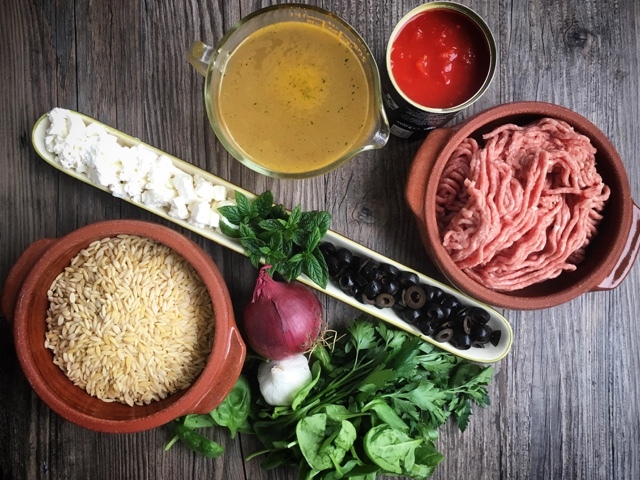 Anything you can do with bolognaise you can do with keema so in addition to the suggestions of toasties, tacos, pasta bakes and more that the Keema Nans came up with, I am now really keen to try my hand at a Keema Lasagna. I bet it would also work really well as the base for a shepherds pie, a filing for stuffed vegetables and on top of baked potatoes. Seriously the possibilities are endless. 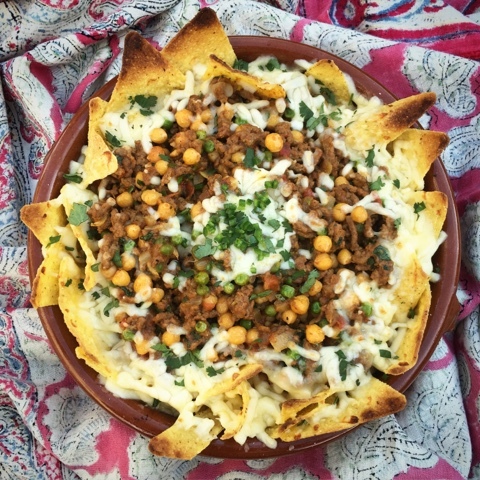 But for now I'm sharing the Lamb Keema Nachos recipe with you. 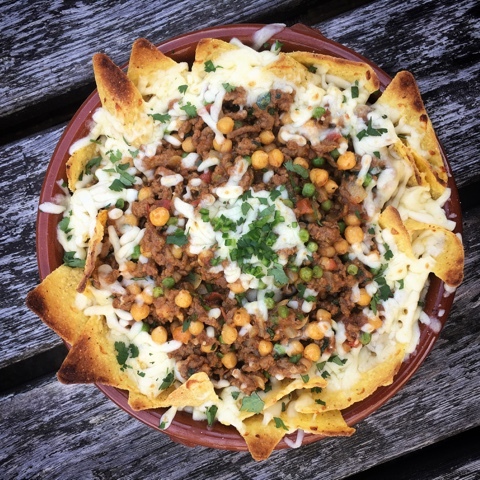 I definitely recommend adding the chickpeas (I used a whole tin), the yoghurt with lime pickle was to die for and when it comes to the cheese it simply has to be mozzarella and lots of it. Enjoy! 1. Heat the oil in a large non-stick frying pan and cook the onion and garlic over a low heat for 10 minutes or until soft and lightly golden. 2. Add the ginger, hot chilli sauce or fresh chillies and curry paste. Cook over a moderate heat for 1-2 minutes, stirring occasionally. 3. Add the lamb and stir-fry for 2-3 minutes, then add the tomatoes, sugar, tomato purée and bring to the boil. Season, reduce the heat and cook uncovered for 20-25 minutes, add the peas for the final 5 minutes of cooking. Stir occasionally and add a little water, if needed. 4. Use as required or cool quickly, transfer into plastic container and freeze for up to 3 months. 1. Preheat the grill to moderate. 2. Put the keema in a large non-stick pan with the stock and chick peas (if used) and heat for 3-4 minutes until piping hot, breaking up the mixture with a wooden spoon. Remove from the heat and stir through the coriander. 3. Arrange the tortilla chips on the base of a heatproof dish. Spoon over the keema and top with the cheese. 4. Bake under the grill for 5-10 minutes, or until the cheese melts. 5. Meanwhile in a small bowl mix together the yogurt and lime pickle or mango chutney. 6. Serve with the nachos. For further Keema inspiration you can watch videos on the Simply Beef & Lamb YouTube channel and find all the Keema Sutra campaign information on their website. Fellow food bloggers have also been getting creative with Keema so do take a look at their dishes. I've also blogged a couple of other fantastic lamb mince recipes. It really does make the best comfort food. 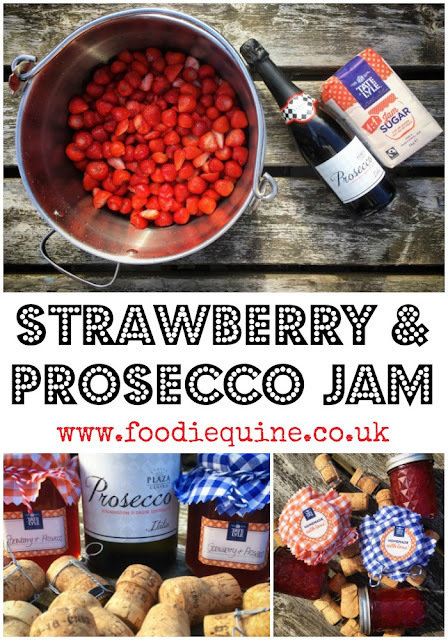 Take your stwrawberry jam to a whole new level of awesomeness his summer with the addition of the fizz of the moment - Prosecco! I'm giving you a legitimate excuse to indulge in booze at breakfast time. There's nothing tastier than a slice of toast with lashings of delicious homemade jam, packed full of fresh fruit. 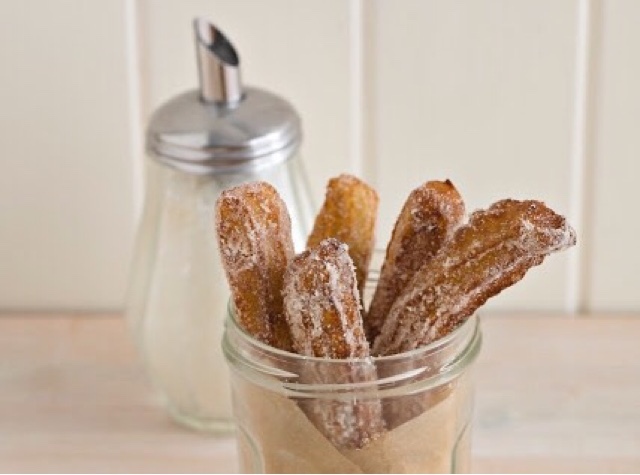 Add Prosecco and this simple pleasure gets even sweeter. Boozy Jam. What's not to like? 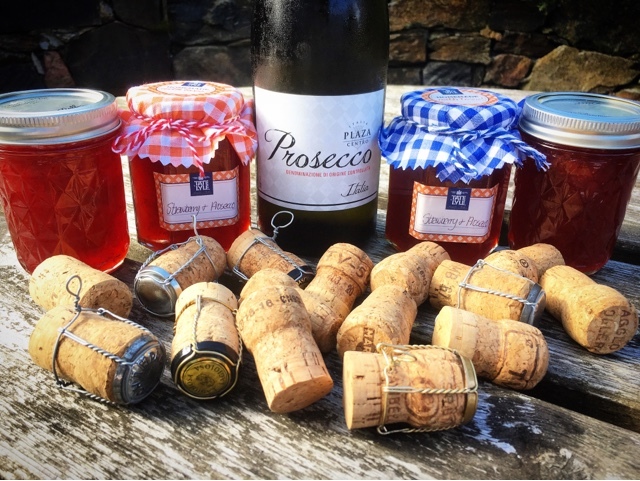 Folk went crazy for my Gooseberry & Gin Jam recipe. 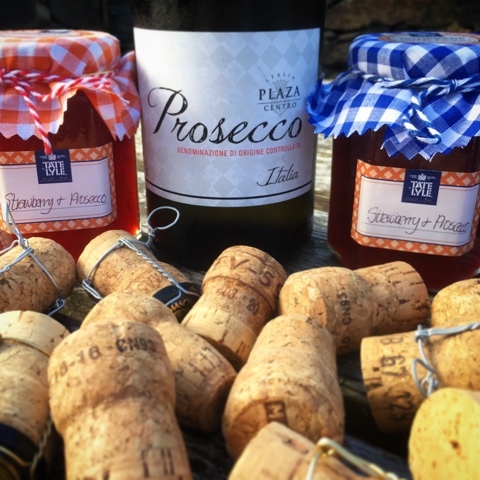 But what another fruit or tipple is more your thing? 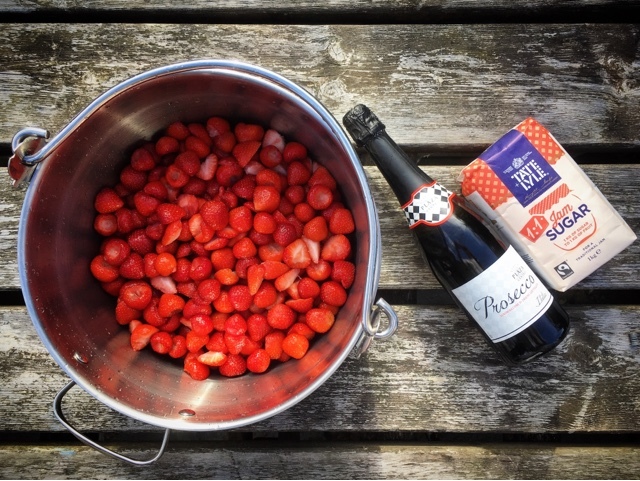 Surely everyone loves Strawberries and Prosecco? Lets make a jam with them! Can I let you into a secret? Jam making really isn't complicated at all. 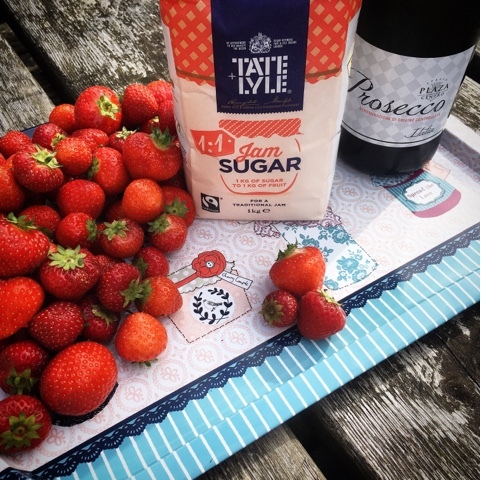 This summer Tate & Lyle is inspiring Britain to ‘get jamming’ with its delicious jam recipes, helpful how to films, and handy jam making guide, jam packed with tips and advice for making your own jam. All you need to do is decide on your favourite fruit and Tate & Lyle Jam Sugar will do the rest. You might be worried about the seemingly complex process of reaching the correct "setting point" for your jam. Too hard and you won't be able to spread it on your toast but too runny and it will be dribbling off the edges. Fear not, you can use either a digital or jam thermometer to test for a set or even the old fashioned wrinkle test. It's all explained in the recipe below. 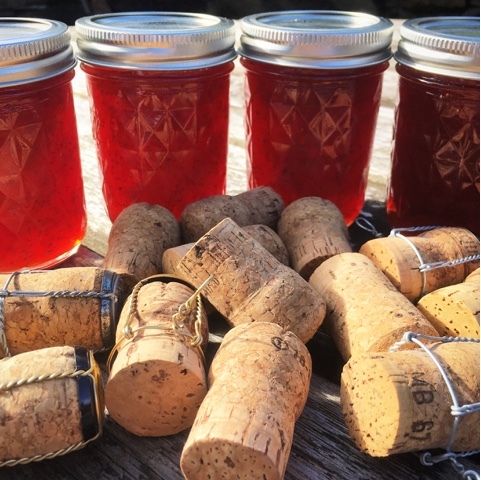 Have you heard of pectin? It occurs naturally in fruits and acts as a setting agent for your jam. 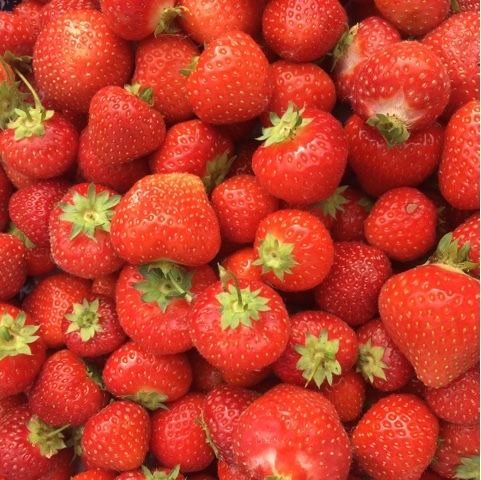 However whilst some fruits like cooking apples and gooseberries are naturally high in Pectin whilst others like strawberries and cherries are low. Tate & Lyle Jam Sugar, made from Fairtrade cane sugar, is the ideal sugar for making jam, acting as a natural preserving agent and enhancing the flavour. 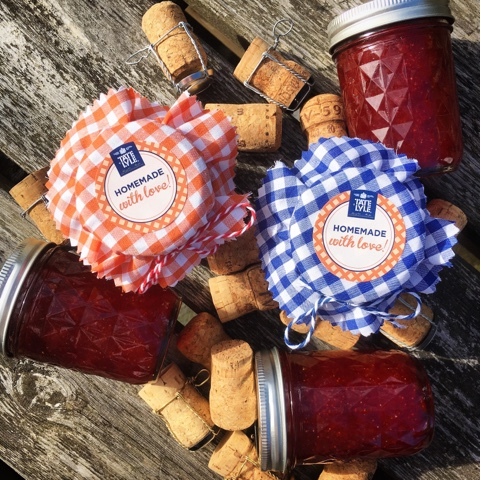 It has just the right amount of added pectin which will ensure the perfect set for your homemade jam each and every time. My paternal Granny made jam. It was kept in a tall dark musty smelling cupboard with a key in the door and a creaky hinge. I can't recall ever seeing her actually making it but I can still picture the jars and jars lined up on the shelves in the dark with their cellophane tops and neat labels. Raspberry, Strawberry and Bramble are the only three I recall. No out-there flavour combinations in the 70's and 80's. Certainly no booze! There's a wee bit of mystery and ceremony to jam making. I recall my mum placing a saucer in the freezer to cool before testing the set of jam by dripping on a small amount, placing it next to an open window and checking for the wrinkle. The jam jars warming in the oven. Jam spoons and Crystal Jam Pots. The Jeely bag handing precariously balanced on stools and a walking stick. Dire warnings not to touch it or the jelly would be cloudy. Stained fingers, mouths and scratched legs and arms from bramble picking along the old railway. With the help of Tate & Lyle am Sugar homemade jam is easily accessible to all our nostalgic selves, from amateurs to more experienced cooks. Ready? Lets jam! Put the strawberries into a large saucepan and place over a low heat, simmering in their own juices for 5 minutes, stirring gently from time to time until soft. Add the Prosecco and stir. Then add the Tate & Lyle Jam Sugar and stir gently until dissolved completely. Meanwhile, sterilise 9 x 200mL jars by washing them in hot soapy water, rinsing well, then place them in a low oven at 150°C/Fan 130°C/Gas Mark 2 for 15 minutes. Increase the heat steadily to a rolling boil. After 15-20 minutes you can test to see if the setting point is ready. If you are using a Jam Thermometer then you can test it once the temperature reaches 105°C. To test the jam for its setting point, remove the saucepan from the heat and spoon a little jam onto a cold refrigerated plate and leave for a few seconds – it should wrinkle softly when you push your finger through it. If the setting point has not been reached, return the saucepan to the heat and continue to boil for another 2-3 minutes. Then repeat the test again with a fresh refrigerated plate. (You may need to test it several times, be patient, as this testing is crucial to achieve the correct consistency). Leave the jam to cool for about 10 minutes in the saucepan before skimming off any scum that rises to the surface and then stir well before pouring the jam into the warm sterilized jars. Seal with the lids and label. Store in a cool dark place. Disclosure : This is a commissioned post for Tate & Lyle. As always, all views expressed are my own. Thank you for supporting the brands who make it possible for me as a passionate Scottish Food Blogger to continue to share my Edible Food and Travel Adventures with you. I’m super choosy who I work with and promise to bring you only the cream of the crop. 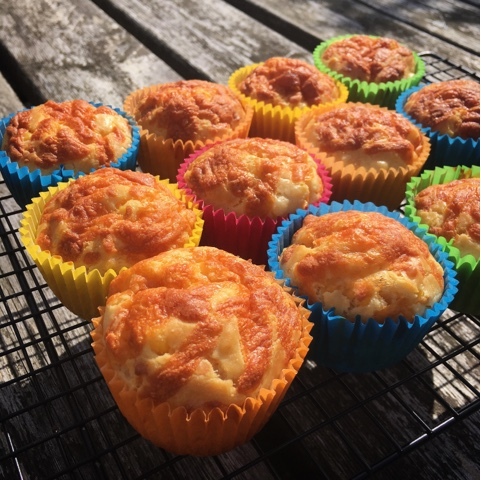 Quick and easy savoury muffins that are perfect for picnics, school packed lunches or to serve alongside soup. Made with frozen sweetcorn (no need to cook or defrost first) these savoury treats freeze fantastically well. Let a Cheesy Sweetcorn Muffin defrost at room temperature or pop one in the microwave for instant yum. Can you actually believe that we're in September? For many that means only one thing. Back to School. Although in Scotland they've already been back for three weeks and we're now on a five week countdown to the October holidays (have I mentioned we're going to Orlando?!) For many parents and kids one of the the daily challenges during term time is what to put in the packed lunch box. Both foodie boy and foodie girl are big fans of school dinners so only occasionally require a packed lunch, which I'm actually quite grateful for if truth be told! 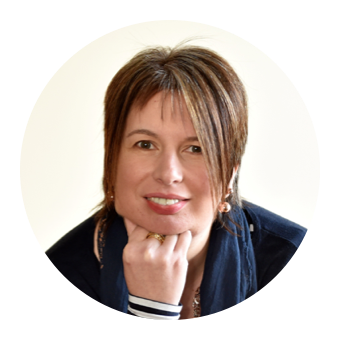 Busy Mums already have more than enough to be doing in the morning getting kids out of bed, washed, dressed, breakfasted, schoolbags packed etc etc. Hats off to anyone who manages to do this without a shouting match and battle of wills! Add in packed lunch and you have all the ingredients for a stressful morning. I've teamed up again with my friends at Iceland Foods to show how the #PowerOfFrozen can help keep lunch boxes fun and healthy. 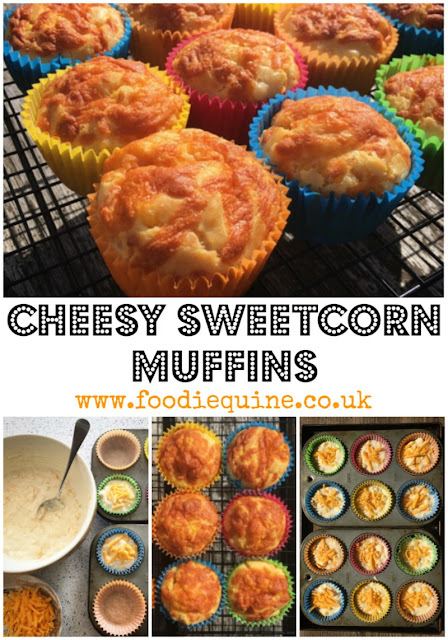 My recipe for cheesy savoury muffins uses the freezer staple of sweetcorn (with no need to cook or defrost it first). The freezer comes into its own once again as muffins of all kinds freeze fantastically well. Simply cool them to room temperature and freeze in airtight bags or containers. 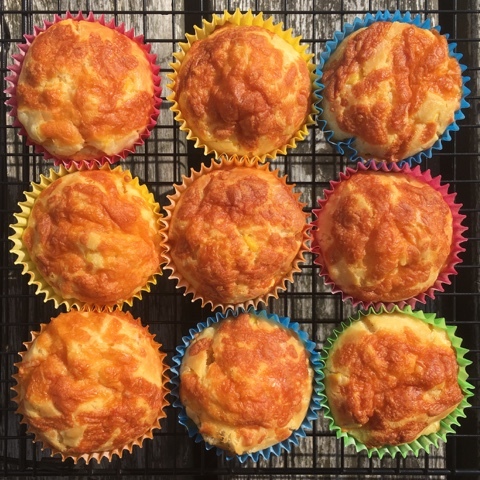 Pop a frozen Cheesy Sweetcorn Muffin in a lunchbox first thing in the morning and it will be perfectly defrosted by break or lunchtime. Muffins are my go to bake when I need something quick and easy. Miranda may not been keen on the savoury version in her lunchbox, but these were a big hit with my two. Even picky girl ate them! My son suggested that they could be spiced up with Cayenne or Smoked Paprika. Yup, he's a better cook than me! In a large bowl sift together the flour, baking powder and salt. Then add the 100g of grated cheddar cheese and mix. In a separate bowl beat the egg with a fork before adding the milk, oil and frozen sweetcorn. 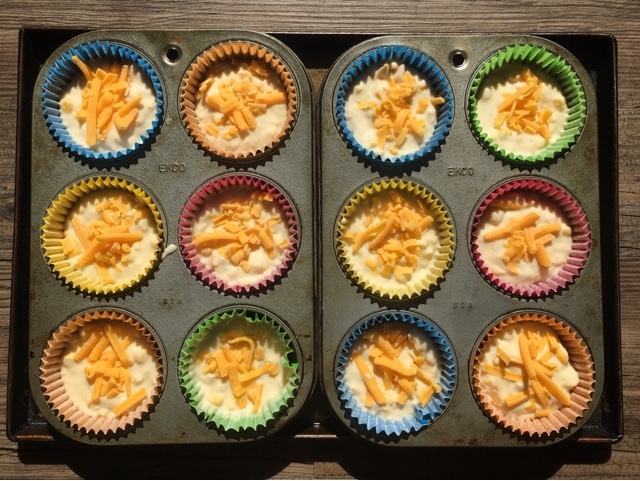 Spoon into the prepared tin and sprinkle the 50g of grated cheddar over the top. Bake for 20 minutes until the muffins are lightly browned and spring back when pressed gently. Disclosure : This is a commissioned recipe for Iceland Foods. As always, all views expressed are my own. Thank you for supporting the brands who make it possible for me as a passionate Scottish Food Blogger to continue to share my Edible Food and Travel Adventures with you. I’m super choosy who I work with and promise to bring you only the cream of the crop.